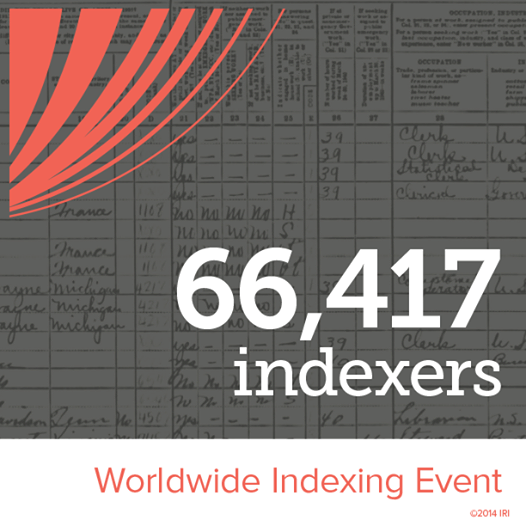 Worldwide Indexing Day a success! So the goal was to have 50,000 people indexing and arbitrating index entries over a 24-hour period. That would set a new record… not to mention getting one whale of a lot of new index entries so name searches would turn up results on FamilySearch. And … oh my … it didn’t start well. Some people tried and tried for hours and didn’t manage to connect. It definitely Did Not Look Good. Thank you so much for your original post on this – I read it on the 19th and decided to help. I always thought that I have so much to do that I just didn’t have the time but your post inspired me. I figured there would be server issues so I signed up and downloaded 7 batches on Sunday morning. I couldn’t get them to upload at 5 so I just waited until 10 pm PDT and had no trouble then. The only problem is that it is addictive. I have had to post a sign that says “No more indexing until blog posts are done.” I am doing the 52 Ancestors challenge and need to finish about 20 blog posts for the last 20 weeks of the year because I have also signed up to take a 9 month Genealogy and Family History class at the University of Washington which starts October 9th. I thoroughly enjoy your blog and find it very helpful! Thanks for joining in the effort! And thanks so much for the kind words.